I’m officially a homeowner – whoa. That is such a thrilling statement but also slightly terrifying because with a house comes house payments, appliances that could decide to give up, (and Lord knows the disaster that would be because I’d blow up the house trying to fix it) being responsible for keeping it clean & organized, (that shouldn’t be too big a problem, I can be a little OCD… sometimes) & a whole lot of other stuff I’m sure. It has been a journey just getting to this point, so I’ll back track a little bit & explain how we got here. Flash back to February when my Dad announced that he’d gotten a job in Virgina. Yay! Wait…huh? What in the world was I supposed to do?? I had just started a job (a good one too) & with our economy just flourishing the way it is – that’s sarcasm by the way, in case you were confused. Economincs was not my strong suit in school, but I do know enough to know our economy is insane right now – I thought that maybe I’d better hang on to it instead of jumping ship & shooting off to Virginia. I prayed lots…and lots…and lots…and then I decided I’d better start looking for a place to live. I had one little, furry friend to take into consideration. Y’all, is he not the cutest thing you’ve ever seen? I mean, I guess the cutest thing with spotted fur & brown eyes? I love this little furball (and he is a furball, he sheds all the time) so much & I knew that wherever I went, he had to come too. I started looking at apartments & I thought I’d have heart failure right there in the middle of the office. Meridian thinks that it is a pretty special place to live & the price for most of the apartments in Meridian reflected that. $800 for a one bedroom?!? Do these people think I am made of money?? To answer that – I’m definitely not. Not. At. All. One of the joys of being a grown-up, as I am quickly learning is that when you get paid, none of that money is actually yours. You have to pay for housing, food, gas, credit cards bills, school loans, medical insurance…and God forbid you end up sick & have to buy meds or something happens to your car & it needs to be fixed. Then you could really be in trouble because all of “your” money is already gone. I had no clue how I was going to pay for an apartment. And there was also the matter of my little furry friend. 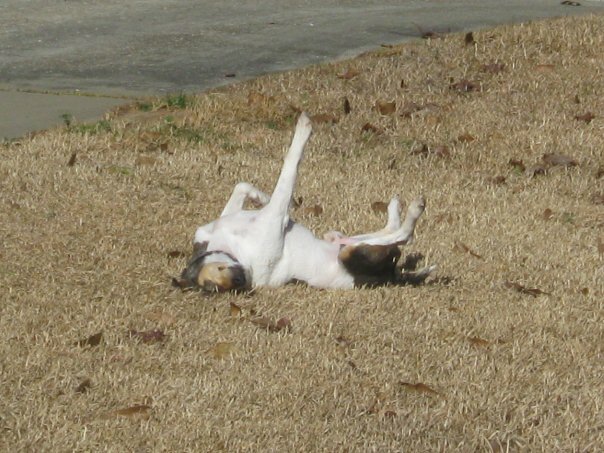 He likes to do things like this – lay out in the yard all crazy like & sleep in the sun. He also enjoys chasing squirrels & birds, digging in the dirt & running all over the yard. If we got an apartment, he would be cooped up inside all day long. That thought made me sad for him – I knew he would always be sitting inside all day while I was at work & he would get bored & depressed. 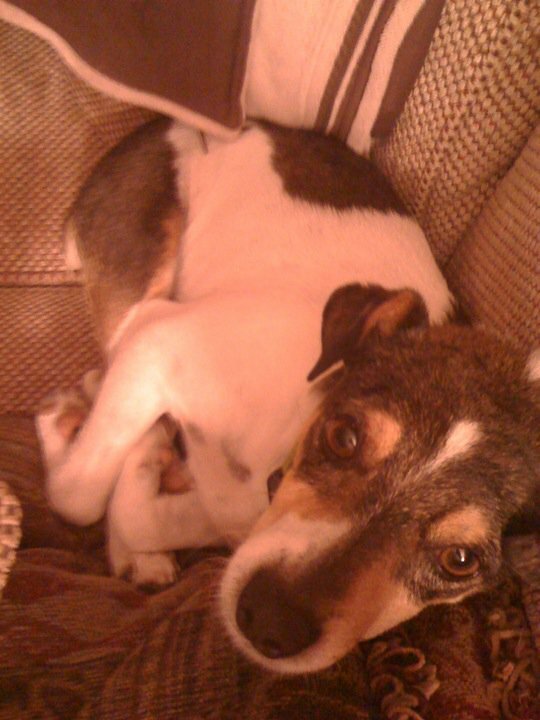 I can’t give my dog Prozac, so I wasn’t sure how that would work. Not to mention, on top of the $800 or so bucks they were wanting for a place to live, they wanted me to pay extra a month for Watson. Essentially, Watson had to pay rent as well – and he doesn’t even have a source of income. If killing moles or begging for table scraps could earn him some cash, he’d be rich…but alas, all that will get him are some dead moles & maybe a nice bite of broccoli. Yes, he eats broccoli. Green beans too. So, I looked into option two. I was going to take up residence in my grandparent’s house in Meridian. There was a yard there…actually, there is a whole lot of yard there…but there were complications. Issues arose & it just became evident that maybe option number two wasn’t going to be the best option either. I thought it would be excellent to be able to re-do the house my Dad grew up in & make it new & fresh, but when that option passed I was glad to be able to take some treasures from my Grandparent’s house. I have a wonderful cookbook that was my Mamaw’s as well as pumpkin candy jar & an amazing marble rolling pin. It will probably flatten some dough pretty well, of course, it might also flatten an intruder’s head if I needed it to. 🙂 One of my favorite things is a wall hanging that was sent to my grandparent’s from my Aunt Joyce. Aunt Joyce is my Grandpa’s sister & was our closest family when we lived in California. I sat on her kitchen counter many an afternoon while she & my Mom worked on something in her kitchen. I’m not sure where I’m gonna hang it yet, but it’s certainly going in my house. Anyway – my Mom & I had been musing about how wonderful it would be if I just had some land to put a trailer on. Watson could have a yard to play in, it would be new & clean & would also be much less a month than an apartment that someone else had already lived in. That option just wasn’t really looking like it was going to work out – but then, a miracle! The land next door to my Grandmother (and incidentally, a stone’s throw from our house) opened up & became available for having something put on it – like say, a trailer for me to live in! Thus, the search began. I fell in deep like with a couple different places, but about two weeks ago I found THE ONE. Once I found it, there was nothing else that could compare. It wasn’t what I expected to fall in love with, but I did. Sidenote – I bet that is how love is. You don’t fall in love with the person you think you should/would & it’s not the person you would have ever imagined yourself with, but once you fall for them, there is no going back. I’ll have to get back to you on that theory. Can I just tell you that the conversation about signing papers & all the stuff involved in owning a home flew right over my head. Escrow in taxes – like, huh? I had no clue what they were saying but thankfully I had those trusty parentals to keep me posted on what exactly it all meant. It must have been a good thing, because the deal was on! Yesterday, the deal was really on. I found myself in an office, signing papers (signing my life away according to my Dad – thanks for the optimism buddy) that made me the owner of a home. I mean, whoa. I cannot even wait to get it in place & start putting my own personal touches on it. So – decisions were made. I think the decision I made was a pretty good one. Now then, since I’m going to be having my own place I’m going to need guests to entertain. Of course, you’ve got to let me get it all in order & then you can come visit & check it all out! Oh yeah – I was gonna stick pictures on here, but I couldn’t get them to link up. Of course, you are probably being directed to here from Facebook so you’ve probably already seen all of them. So there you go!